One of most interesting aspects of deck-building in the Conquest LCG is the signature squads. When making a deck, the first decision is which Warlord to use. Warlords are somewhat like heroes in Lord of the Rings LCG. They begin in play, and they constrain the cards that can be included in a deck. In addition, each Warlord in Conquest comes with signature cards. These are eight cards which must be included in any deck which includes that Warlord. These cards cannot be included in any other decks (without that Warlord), and they support the ability and strategy of their Warlord. As much as this idea of a signature squad might be intriguing, it doesn’t fit well with traditional Lord of the Rings deck design. First of all, most decks have more than one hero – most often three. Secondly, the idea of limiting a deck’s design by forcing 8 cards (16% of a 50 cards deck) into it would not sit well with most players. With a larger card pool and the potential provided by multi-sphere decks, it just doesn’t make sense to force cards on players. Lastly, there really isn’t a need for something like signature squads. Even in the case of mono-sphere decks, Songs and events like A Good Harvest allow any deck the flexibility it needs to implement most strategies. While all of these criticisms might apply to traditional deck-building, the area where I can see signature squads making the most sense is in a draft format. One piece of consistent feedback that I received from running the first version of Bear Draft at Gen Con last year was the difficulty in drafting and building a deck with a cohesive strategy. In retrospect, this makes complete sense, but it is often best to see a system in action before you decide how to improve it. An example of the challenge to cohesive deck-building is a card like Celebrían’s Stone. 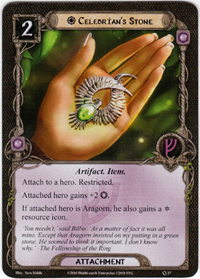 In a traditional deck, this card will almost always be included with a version of the Aragorn hero. 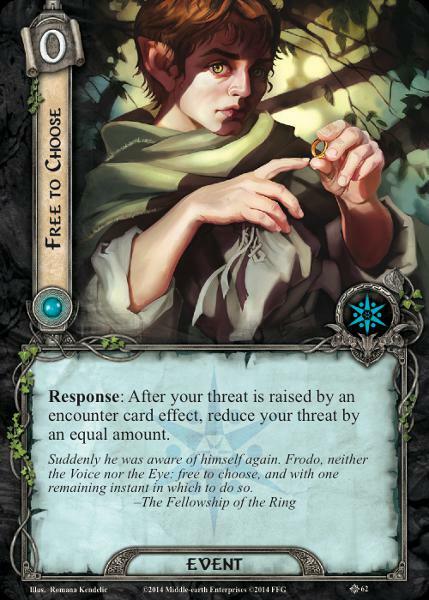 Granted this card is excellent even in decks without him, but the secondary ability on this attachment makes it a great tool in multi-sphere decks built around Aragorn. 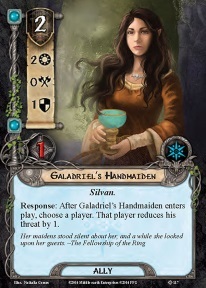 However, a player who might have already drafted Leadership Aragorn could be hard-pressed to be able to draft even one copy of Celebrían’s Stone, as this is the kind of highly efficient card which other players will be looking to draft. Two resources for 2 bonus willpower is good in essentially every deck that features Leadership. This is where signature squads come into play in the latest version of the Bear Draft. The concept is simple, and it should provide some much-needed cohesion and consistency for draft decks. After drafting their hero and players, each player will select their three starting heroes. Then, they may optionally select one of these heroes to be their General. Much like a Warlord in Conquest, a General has its own signature squad. Instead of 8 cards, the signature squad in Bear Draft v3 consists of 6 cards. Instead of these cards being a requirement they are optionally available to include in a deck which features that General. The idea is to give a few extra cards to help flesh out the core strategy of your deck, not to force you to include cards which may not match your overall deck design. To provide an example, let’s say that I choose the following as my starting heroes: Celeborn, Arwen, and Beregond. For the sake of this hypothetical, let’s say that I was able to draft a good mix of Silvan allies among my player cards. Before building my deck, I can choose one of these heroes to be my General. 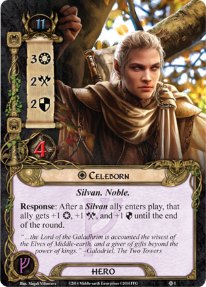 In this example, the choice is an easy one as I want to build a deck around the powerful benefits which Celeborn bestows upon Silvan allies. 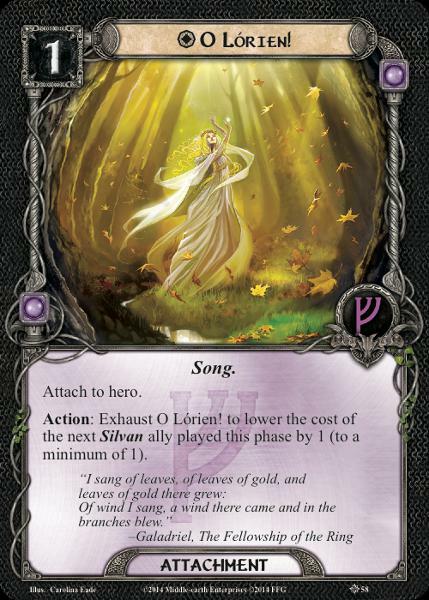 By choosing Celeborn as my General, I have the option of adding the following cards to my deck: Naith Guide, O Lórien!, and Feigned Voices (see the list of signature squads at the end of this article). Unless otherwise specified, up to two copies of each signature squad card can be added to a player’s deck. Exceptions are for more niche cards, or cards like Black Arrow which have a limit of 1 per deck. These are marked with a (x1) in the list below. This means that I can add these cards to my deck, and combine them with whatever player cards I have drafted. My minimum deck size is still 40 cards, but I know that 6 of them are directly relevant to the strategy of my chosen General. Because I was able to draft some Silvan-related cards to add to my signature squad, there is an excellent chance that my 40 card deck will play consistently. I might not be able to field a deck where every ally is Silvan, but I can have enough of them to avoid having Celeborn’s unique ability go to waste. This solves one of the biggest problems with earlier versions of the Bear Draft, which was that is was very difficult to build a solid decks around most archetypes because of the limited availability of critical cards. The same deck-building limitations still apply, so no more than 3 copies of a card can be included in a deck – regardless of whether that card is part of a signature squad. If I happen to draft two copies of Naith Guide, I can only add one of those drafted cards to the two from Celeborn’s signature squad, leaving me with 3 total copies of that card. Signature squads do not let you break basic deck-building rules. Another advantage to this approach is that is allows me to reduce the number of cards like “O Lórien!” which are included in the main draft pool. While a card like this is essential in a dedicated Silvan deck, its narrow focus provides limited to no value in other decks. By reducing the number of these kinds of trait and archetype-specific cards in the main draft pool, it leaves more room for general purpose cards which will fit into many kinds of decks. Ultimately, cards like Sneak Attack and Cram – cards with versatility – are necessary to ensure that each player can draft and build viable decks. This article is the first in a series detailing the latest version of the Bear Draft format, but as signature squads are the biggest change I wanted to cover this concept first. When reviewing the list below, readers will no doubt notice that some heroes have very powerful signature squads. This is by design. Characters like Aragorn, Elrond and Galadriel are very powerful and play important roles in Tolkien’s stories. It is fitting that they should have access to the powerful rings, swords and other artifacts with which they are so closely associated. On the other hand, lesser characters might not be the best choice as Generals, at least for players who care most about making powerful decks. Even so, I tried my best to make the signature squads thematically appropriate. There are cases where the most powerful combinations where left out of a signature squad in favor of cards which I consider more iconic or thematically appropriate. For those interested in the draft format, or limited formats in general, I am curious to hear feedback on my choices. For some heroes, it proved most difficult to pare down their signature squad to only six cards. With others, especially the lesser-known characters, it was a stretch to come up with a list that made any kind of sense. You can look forward to a post on the updated player card pool for Bear Draft v3 in the near future. My goal is to find the right mix between the unique challenge of a limited format and the joy which comes from playing a well-crafted deck. Hopefully I can run this updated version of the Bear Draft in the near future, to see how signature squads work in practice. In the mean time, it is a fun exercise to think about which General is your favorite, or which signature squad best fits your aesthetic. Longbeard Orc Slayer, Narvi’s Belt, To Me! O My Kinsfolk! Bill the Pony, Hobbit Cloak, Taste it Again! Spear of the Mark, Foe-hammer, Forth Eorlingas! This entry was posted in Community, Draft, Fun, GenCon, Strategy and tagged Bear Draft, Conquest, Draft, Fantasy Flight Games, GenCon, General, Living Card Games, Lord of the Rings, Signature Squad, Tolkien, Warlord. Bookmark the permalink. First of all, I hit the like button just because the featured image made me laugh. Then I read the article. Though I have yet to try Bear Draft, I have to say that the concept of Signature Squads (I’ll admit I didn’t know about this aspect of Conquest either) in this game is very interesting and makes me want to go out and draft now! Ha, I’m glad that others appreciate this image as well. I can tell you from my own experience that drafting LotR might at first sound a bit strange, but it ends up being a ton of fun. I especially like how it forces you to make use of cards which you would not ever consider in your constructed decks. It would have been cool having Strider’s Path with Loragorn. Hmmm, good point. I went ahead and replaced Quick Ears with Strider’s Path. It was only a statement!